“There’s such a need for good public theology,” tweeted Fr Gregory Platten, Vicar of All Saints Church, London, N20. 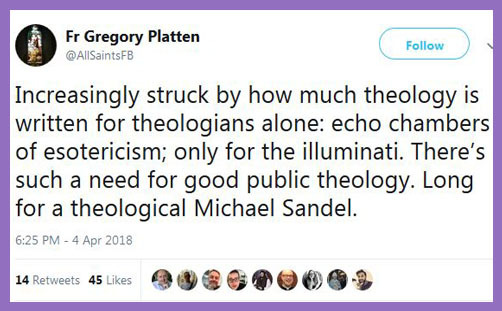 “Increasingly struck by how much theology is written for theologians alone: echo chambers of esotericism; only for the illuminati,” he explained, desirous of an encounter with “a theological Michael Sandel”. ..In April 2012, BBC Radio 4 broadcast a three-part series presented by Professor Sandel titled The Public Philosopher. These followed a format similar to the Justice lectures, this time recorded in front of an audience at the London School of Economics. Across three programs, Sandel debates with the audience whether universities should give preference to students from poorer backgrounds, whether a nurse should be paid more than a banker, and whether it is right to bribe people to be healthy. ..Sandel is the author of several publications, including Democracy’s Discontent and Public Philosophy. Public Philosophy is a collection of his own previously published essays examining the role of morality and justice in American political life. He offers a commentary on the roles of moral values and civic community in the American electoral process.. So it’s the craft of popular philosophy, or, rather, the art of making philosophy popular. Then Pandulf chipped in: “How many #Cathedrals have Canon Theologians? Are they engaging on an accessible level for the general church goer or are they just focused on so called “higher” level? There is a great need to “do/engage” in theology not just read it. Then something stirred in the higher echelons. “Some of us do it, but in language that then gets put down as ‘demotic’,” chipped in Bishop Nick Baines, taking a rare coffee break from Brexit bashing. “Which ‘public’ is public theology for?” he grunted. Which is rather a good question. Theologians who attempt to do public theology are not infrequently accused of ‘dumbing down’ the Faith (or of ‘meddling in politics’ – for what public theology does not concern itself with temporal questions of truth, peace and the sugar tax?). So ‘demotic’ is good. After all, wasn’t Jesus rather demotic? While the scribes and pharisees waxed lyrically and esoterically about the jots and tittles of God’s law, Jesus fed the crowds with bread a fish and told them to love one another. It all went down rather well. The Church of England has got its food-banks, though God forbid anybody might descend on one and hear about Jesus. Far better just to give out bags of pasta and tins of beans: that’s the gospel in action. The problem with doing public theology in a postmodern, secular (or ‘post-Christian’) context is that you need to avoid speaking Greek (cf 1Cor 1:23). Theologians generally aren’t very good at that: they like to speak Greek in order to show that they can, for their learning and intellect is the source of their authority to pontificate esoterically. A theologian with no Greek is like a soul with no music. And yet the public craves music, not Greek, for therein thrives superstition – whatever you believe is true. So theologians need to sing the songs of public doctrine if anyone is to remember them. Not literally, of course (though the Bishop of Leeds has probably already composed his Battle Hymn to thwart Brexit), but there’s no point trying to do public theology in a secular, liberal world if your theological impetus is to preach about Christian commitment with no grasp of the virtues of secularity or liberalism: it’s just Greek. “Which ‘public’ is public theology for? How do you communicate doctrine that is formal, authorised and explicit in a world which demands informality, easiness and ambiguity? Does public theology not need to begin with an acknowledgement that the sacred canopy of Christianity has been dumped in a bunker of liberal secularism; and that a principal reason for the confused sea of public voices and the muddled plurality of doctrines is that far too many theologians have been more concerned with honing their particular political truths to stimulate itching ears than with distilling a prophetic message of counter-cultural transcendence? The Church of England needs to rediscover its role as the national organ to foster intimate, ultimate values which enter into human life. Public theology needs to be engaged in the mission of salvation more than the mission of civilisation. Our revolution is soteriological before it is ‘social’; metaphysical before it is ‘progressive’. Let us rejoice in our collective enthusiasms, revivals and church institutions by all means, but not before we have imparted the fact of Christ who transforms hearts and minds with infinite contingent potentialities.